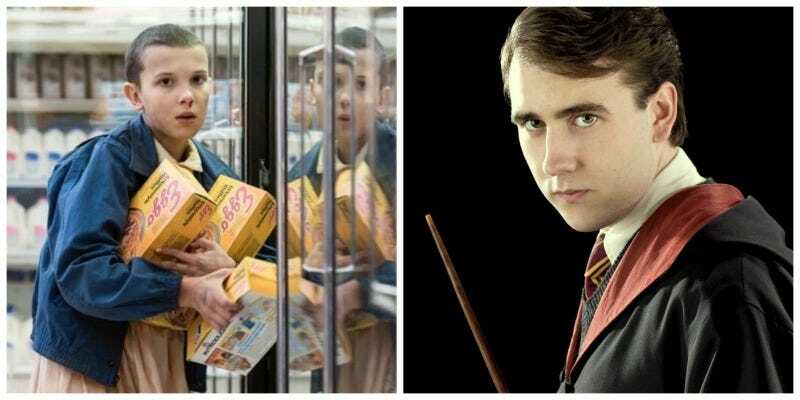 So Harry Potter’s Neville Longbottom and Stranger Things’ Eleven have been hanging out, which is a sentence that fills us with an incredible happiness. But somehow this picture of actors Matthew Lewis and Millie Bobby Brown together is still far more delightful than you can imagine, since they bonded over Lewis’ tattoo. Though it’s absolutely certain that someone, somewhere, has already inked a permanent tribute to the Netflix hit on their body, Lewis isn’t one of them, despite the very cute caption here; back in 2008, he told Entertainment Weekly that 11 was his soccer squad number. That said—it sure looks like he has room for “Winona Forever” on that arm, too, if he’s looking to continue the theme.